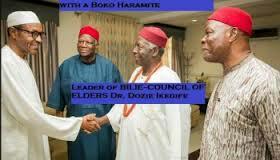 NNAMDI KANU ALONE COMMANDS BIAFRANS WORLDWIDE: THERE IS NO SUCH THING LIKE IPOB ELDERS--BIAFRA WRITERS. The attention of BIAFRA WRITERS has been drawn to a misleading publication on the Nigerian dailies especially THE PUNCH in which certain interlopers and mischief makers identified as the “Supreme Council of Elders of Indigenous People of Biafra, SCIPOB,” denied alliance with the activities of liberation fighters also known as the Niger Delta Avengers(NDA). To start with, we in Biafra Writers, and the National leadership of the Indigenous People of Biafra under the firm leadership of Mazi Nnamdi Kanu have severally made it known that there is absolutely nothing like IPOB Elders or Chieftains. IPOB has nothing whatsoever to do with miscreants seeking for federal jobs from the Nigerian government. Their ‘once-in-a-while’ appearance on the national dailies is only to raise an already settled dust to confuse or deceive the gullible and unsuspecting public. They are not in any position to decide or map out directions IPOB chooses to follow nor decide who they wants to align with or not. Secondly, our leader, Mazi Nnamdi Kanu had since severed any form of connection or relationship with the so-called IPOB Elders due to verified inconsistencies, sabotage and dubious manipulations against the targeted goal of the Biafra restoration project. In the press statement, IPOB threw their weight behind the onerous and justified activities of our brothers- the Niger Delta Avengers and distanced itself from other pro-Biafra groups and individuals, whom are not in support of the activities of the NDA. The statement read: “The Indigenous People of Biafra under the leadership of Mazi Nnamdi Kanu hereby state that we support our kith and kin- the Niger Delta Avengers, who are fighting for the freedom of our people from the enslaving Nigeria government. For the avoidance of doubt, we wish to make it unequivocally clear that unlike the Boko Haram Islamic fundamentalist group(Terrorists), the NDA has even been peaceful and patient with the Nigerian government. They have never slaughtered or wasted a single human blood in carrying out their activities. Their activities has been justified in that they only seek for equity and justice over the many years of injustice and cruelty meted out on our people. Their demands were clearly stated which amongst them is the unconditional release of the leader of IPOB, Nnamdi Kanu and the peaceful dismemberment and disintegration of Nigeria. Following their demands, no sane group or persons who claims to be fighting for the sovereignty of the Biafran state will deny alliance with them or tag them to be violent or whatever name. The group of people shamelessly parading themselves as Supreme Elders of IPOB so long as we are concerned does not exist. Chief Eze Ozobu, Dr. Dozie Ikedife and their cohorts are known not to support any genuine activities that will bring about the restoration of the Biafran nation due to their compromised stance and mingling with any government that comes to power in Nigeria. People should not take them serious because they are only disjointed bands and political job seekers who are out to refill their pockets from the Muhammadu Buhari government. They never meant well for the Indigenous People of Biafra neither are they genuinely fighting for the liberation of Biafrans from the evil grip of the contraption Nigeria. They are the set of people along with mischief makers of Ohanaeze Ndigbo(untrusted elders) who uses the Biafran restoration project to blackmail or seek for illicit monetary settlement from the Nigerian government. IPOB has made it clear times without number that there is absolutely nothing like IPOB Elders or Chieftains or whatever rubbish they choose to answer. If at all we deem it necessary to elect any panel of Elders in IPOB, definitely, you can be assured that the likes of Eze Ozobu, Dozie Ikedife, Debe Ojukwu and their cronies can never make the list. This is because aligning with such “wolves in sheep’s clothing” personalities will never augur well with the Biafran restoration project. They will bring woes, jeopardy, sabotage and nemesis to the liberation struggle. 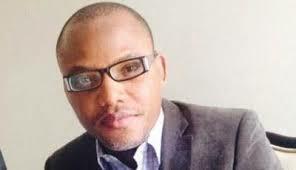 Finally, BIAFRA WRITERS wishes to reiterate their stand with the Avengers and other similar groups. “We want to make it verifiably and unambiguously clear that we are undoubtedly in league with our brothers-- the Niger Delta Avengers and other liberation forces in the riverine areas of Biafra(Bight of Biafra) genuinely and consciously seeking for the disentanglement and exit from the British empire called Nigeria. We are out and determined more than ever to exit Nigeria just like Britain recently exited the European Union, EU.